Edward Cullen (né Edward Anthony Masen) is a fictional character from Stephenie Meyer’s Twilight series. He features in the books Twilight, New Moon, Eclipse and Breaking Dawn, as well as the Twilight film, and the as yet unfinished novel Midnight Sun – a re-telling of the events of Twilight from Edward’s perspective. Edward is a vampire who, over the course of the Twilight series, falls in love with, marries, and has a child with Bella Swan, a human teenager who later chooses to become a vampire also. 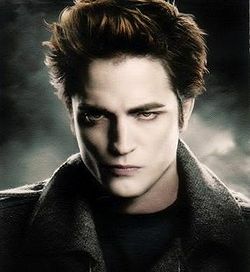 In the 2008 Twilight film, Edward is played by actor Robert Pattinson.